My favorite baseball book since MONEYBALL is THE YANKEE YEARS! Now that the controversy has died down and the NY Post has stopped splashing trashy headlines, it's a good time to pick up Joe Torre's THE YANKEE YEARS. Co-written by Tom Verducci, this is not a hatchet job. It's not a "tell-all" as some in the media would have you believe. If you want to know what baseball is really about, this is a killer read. Torre was not the first choice for the Yankees managerial job when he was hired. He wasn't even the second or third choice. But he was the perfect manager at exactly the right time. The players who star in the story are David Cone, Derek Jeter and Mariano Rivera. In fact, the Yankee Dynasty at the end of the last century may never have happened without them. And, while they were winning, the Red Sox were changing the way they do business, which is also detailed in the book. When John Henry, Larry Lucchino and Tom Werner took charge of the Sox, they became enamored with statistical analysis. Keep in mind that this was before the publishing of MONEYBALL by Michael Lewis. So, they hired Bill James and kept Dan Duquette. But Theo Epstein started putting his Ivy League degree to use. While Billy Beane was chasing players with a great on base percentage, Theo took charge of Boston and went after many of the same players with money to spend. In one winter, Boston acquired Kevin Millar, Bill Mueller and David Ortiz. That became the core of the team that would finally bring a Word Series Championship to Boston. Here's a great nugget from the book. The Red Sox have compiled a database of every college baseball player in history. Then they matched those performances with the way those same guys played in the big leagues. Now, they can look at the numbers of current college players and see trends that nobody else sees. That's how far ahead of the game Boston is right now. Torre tells the ultimate ARod story. In Alex's first year in New York, he was struggling in May. Joe pulled him aside and said, "You're gonna be OK." Alex responded, "My numbers are exactly the same as they were last year at this time." That embodies everything that is wrong with ARod. Torre was concerned about Alex as a person, and he measures himself by statistics. The bottom line is that if you want to understand the game of baseball in the late 90's and the early part of this decade, read THE YANKEE YEARS. You will understand why Torre is worth every penny of what Frank and Jamie McCourt are paying him. For more, check out our interview with Joe about the book from a couple of weeks back on the Mason & Ireland Show. It is official. Contrary to popular belief, this Twitter profile is NOT the real Kobe Bryant. Confirmed by Kobe's representatives. C'mon Kobe. Start Tweeting. I am a huge fan of USC coach Tim Floyd. He is a whip-smart basketball mind, a remarkable recruiter and, given the resources he has available to him, Floyd is the best possible man for this job. Let’s face it. Floyd operates in Peter Carroll’s shadow. USC is a football school, and, despite the fact that the Trojans now have the state-of-the-art Galen Center, the Southern Cal basketball program will always be in the shadow of UCLA’s basketball legacy as well. Tuesday, Floyd joined us on the Mason & Ireland Show on 710 ESPN, and he refuses to speculate about whether or not super freshman DeMar DeRozan will return for his sophomore season. He did talk to us about how important guard Marcus Simmons was in the Pac 10 Tournament, especially at the defensive end of the floor. Simmons shut down Cal's Jerome Randle, UCLA's Darren Collision andArizona State's Derek Glasser in back-to-back-to-back games, and now he will be called upon to neutralize Boston College’s best player, Tyrese Rice, tomorrow in their first round matchup in Minneapolis. Rice is averaging 17ppg, and Floyd is famous for his ability to defensively take out his opponent’s #1 offensive option. I like the Trojans to win here, but I think they lose to Michigan St. in the second round….although, I’ll be rooting for them. What do Bobby Braswell and Job have in common? A lot. Cal St. Northridge head coach Bobby Braswell is a great guy. Always has been. He has had a really tough year, but has still found a way to get the Matadors into "The Big Dance." Job had it a little tougher than Braswell in the last 8 months....but not by much. 1. Coach Braswell was totaled his car in an auto accident and suffered injuries in the crash. 2. The coach's son Jeffrey will likely stand trial for allegedly scamming the Best Buy in Porter Ranch. In fact, the Braswell family was in court on Monday, hearing evidence. The contention is that the younger Braswell was involved in boosting 2 laptop computers and some video game consoles and movies. 3. CSUN's leading scorer Deon Tresvant is implicated in the alleged crime and has been lost to the team since early January. Also involved was Matadors guard Dallas Rutherford, who has pleaded out to a lesser charge. 4. Matador starting point guard Josh Jenkins was involved in a car accident on Valentine's Day. He required surgery and is gone for the year. What a run of bad luck. Yet still, Braswell guided his team to the Big West conference tournament for a crack at "The Madness." Now Thursday morning, the Matadors will face #2-seed Memphis in Kansas City, and they have almost no shot to win against a John Calipari-coached team that has won 25-in-a-row. Plus, Braswell spent all day Monday in court with his son. He left the courtroom at about 4:30p and ran a 5:30p practice, but it must be incredibly hard to focus on the task at hand. Regardless, Coach Braswell's effort has been heroic, and I hope the guy helps his son out of whatever mess he's in. By the way, the Sacramento Bee reports that Braswell is only the 8th-best paid coach in the UC system, making just $151K per year. For Northridge, he's probably worth his weight in gold. You can listen to our entire Mason & Ireland conversation with Coach Bobby Braswell at this link. Wednesday on the Mason & Ireland Show on 710 ESPN, Lakers center Andrew Bynum joined us. He told us that his knee injury (a sprained MCL) is way less severe than last year's kneecap subluxation, which required surgery. If you want to hear the whole interview, go to this link. Phil has been very testy when asked about Bynum in the last couple of weeks. His standard retort is "I'm not talking about it until April." You could interpret that as meaning that Andrew's rehab isn't going well, but I am of the belief, and he backs it up in our conversation, that he will be back for the playoffs. Ideally, he could come back for a few games down the stretch. A suggestion/hunch? Maybe he comes back for the Lakers home game against the Clippers on Sunday, April 5. Then he gets 6 games: h Clippers, @ Sacramento, h Denver, @ Portland, h Memphis and h Utah, before facing whoever the 8-seed is in the Western Conference. Bynum coming back is important for 2 reasons. With Bynum back in the lineup, either Trevor Ariza or Lamar Odom could shift back to the 2nd unit, which has been struggling mightily the last couple of weeks. And, of course, he gives LA a physical presence down low. He is tough (just ask Gerald Wallace), and it'll be hard to out-physical the Lakers with Andrew on the floor. FINAL "MARCH BADNESS" BRACKETS - Red, Ledger's Joker, Bonds & Lecter as #1 seeds! On Tuesday's Mason & Ireland Show on 710 ESPN, we decided that we would do a different kind of bracket contest. While I was watching Breaking Bad starring my friend, and Emmy winner, Bryan Cranston, AMC was promoting March Badness. The idea is that they show The Godfather, The Godfather II, Terminator, etc. a bunch of times, and they give it a catchy name. We decided that we are going to do our own version of March Badness, filling brackets with the greatest sports, movie and TV villains of all time. Then we play out a tournament online, letting people vote online at 710ESPN.com. We will unveil the final field of 32 on Wednesday's show. BATTLE OF INITIALS: And Collison v. Maynor! 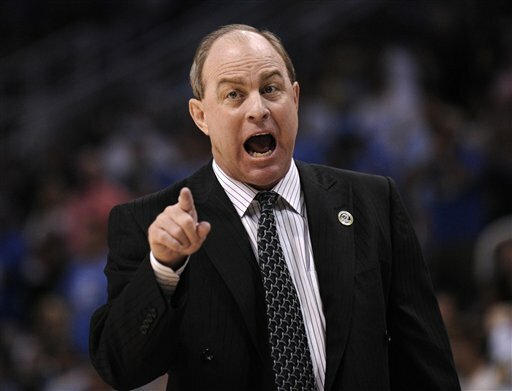 Thursday in Philly, Ben Howland will attempt to continue his remarkable NCAA tournament success as head coach at UCLA. The Bruins have been to 3 consecutive Final Fours, but this is easily the toughest draw. Even in 2005, a tournament where his UCLA team made a first round exit at the hands of Texas Tech, UCLA stayed stayed in the West losing to the Red Raiders in Tucson. In 2006, the Bruins opened in San Diego then played the regionals at Oakland, ultimately losing to Florida in the championship game. Then in 2007, it was Sacramento and San Jose before losing to the Gators in the National Semifinal. Last year, they began in Anaheim and hopscotched through Phoenix, losing to Memphis in the Final Four. In this year's tourney, the Bruins are flying 2,400 miles to the Keystone State, while the Virginia Commonwealth Rams will be playing about 200 miles away from their home campus. To make matters worse, if UCLA survives 2-time Colonial Athletic Conference Player of the Year Eric Maynor and VCU, they will likely be forced to play Big East 4th-place finisher Villanova on their home floor at the Wachovia Center. It's a battle of initials: UCLA vs. VCU, and Howland's Bruins are at an extreme geographical disadvantage. How many UCLA fans will be in Philly? Not as many as attended games in Tucson, San Diego, Oakland, Sacramento, San Jose, Anaheim and Phoenix, that's for sure. With VCU being so close, Howland is facing back-to-back virtual road games. The opener is also a tough match-up on the court with the Rams coached by Billy Donovan disciple Anthony Grant. Maynor is one of only 3 players in the country averaging 22 points and 6 assists per game, and it was Maynor's 15-foot dagger that sent Duke home in the first round 2 years ago. The Bruins are all about Darren Collison veteran leadership at both ends of the floor, but he is battling a bruised tailbone. He says he's good to go, but also acknowledges that it affected his play in UCLA's tournament loss to USC Friday night. This is all a long way of saying that it would require multiple miracles for Howland to get to the Final Four for a 4th consecutive year. In fact, I'm betting that there isn't even a Sweet Sixteen in the cards. If the Rams don't beat 'em, Villanova will. BC is young & inconsistent making USC's First Round tourney game very winnable! It was a phenomenal weekend for Tim Floyd and the USC Trojans. Super freshman DeMar DeRozan led them past Cal, UCLA and Arizona St. as Southern California goes to “The Big Dance” for the third straight year. Looking at the way the seedings for the tournament went down, there is no doubt in my mind that USC would have been left out of the field of 65 had they not come back to beat ASU. Counting the Pac 10 tournament, the Trojans finished the year on a 5-game winning streak, and they are healthy and in-stride for the Madness. Since back-to-back dog games against the Washington schools February 19-21, DeRozan has been a huge force. (He was 2 of 8 against Washington St. and 3 of 10 against Washington.) In the last 7 games, DeMar is shooting 61% from the field for about 17.5 ppg and 6 rpg. He is finding himself at exactly the right time. Junior guard Daniel Hackett gives them a steady presence at the point, and Taj Gibson is an animal down low, but Floyd relies heavily on 4 guys – DeRozan, Hackett, Gibson and junior Dwight Lewis. If one of those guys gets into foul trouble, it makes USC very vulnerable. Sophomore G Marcus Simmons has become a dynamic defensive star, and Floyd is playing him more and more (32 minutes against Cal and 38 minutes against UCLA). He brings the defensive grit that helps to suffocate a team like the Bruins. Troy’s opponent in the first round is Boston College, who was 22-11 while playing in the ACC. With the ACC tourney included, BC lost 5 of its last 9 games, but they almost upset Duke in the first round of the conference tournament falling 66-65. The Eagles go-to-guy is senior guard Tyrese Rice. He is averaging 17 points and 5 assists per game, and he has played over 4,000 minutes of big-time D1 basketball, much of it against the elite ACC. But aside from Rice, they are very young. In fact, 7 players in Al Skinner’s 9-man rotation are freshmen or sophomores. Young and inconsistent. Boston College team did something amazing this year. They won at North Carolina. That’s pretty good, but not amazing. The amazing thing is that they lost at home to Harvard three days later. One guy for Floyd to watch, aside from Rice, is 6’5” sophomore guard Rakim Sanders. He has led the Eagles in scoring 8 times this season, and he has drilled 2 buzzer-beating, game-winning baskets. Overall, this is a winnable game. USC can beat Boston College. The Trojans’ second round opponent would be regular season Big 10 champion Michigan St. That is an unbelievably tough spot for SC, but let’s take ‘em one at a time.